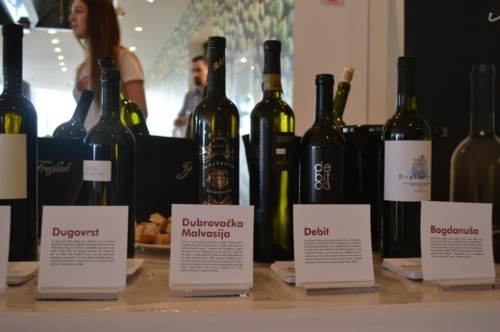 The annual showcase of Dalmatian wines is always a great opportunity to taste and compare the various offerings. We’ve been to nearly every one since it first opened in Makarska five years ago. Back then it was rather more informal, held in a sports hall with a fine collection of Dalmatia’s wine producers, including even Mike Grgich himself! 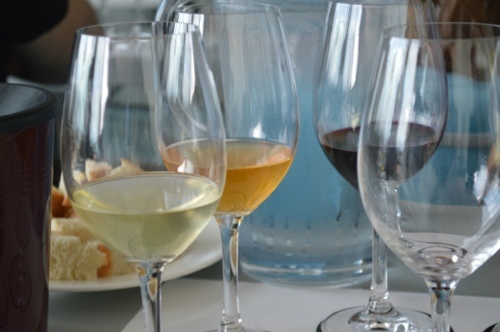 Over the years it’s evolving into a more educational event, with seminars, guided tastings, and wine and food pairings. 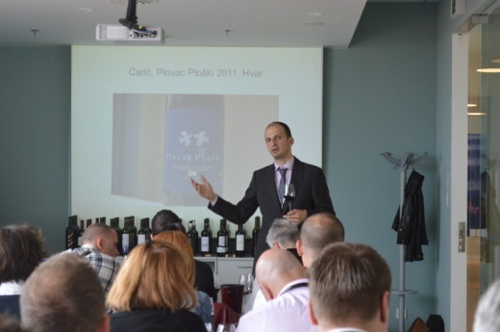 For example, on the first day we went to a very interesting talk about the best Plavac Mali wines from the 2011 harvest. 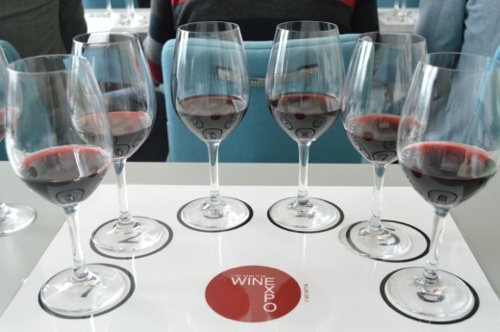 It was amazing how different the 14 wines were, even those within a fairly close area. Of course these were very young as yet, and would not expect to be on the market for another year. I’ll post more details in a separate blog for those interested. 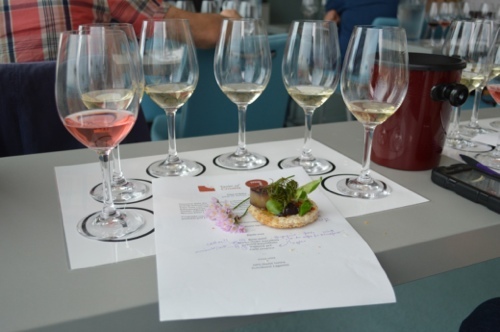 Around the expo floor, we took the first day to sample local variety whites and rosé wines. So which of those stands out in my memory two days later? 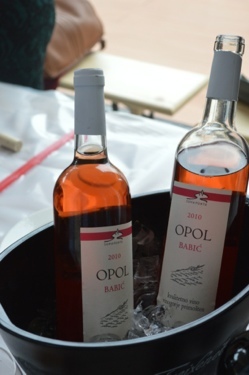 Suha Punta winery’s Opol rosé made from Babić grapes was an amazing experience, so full of flavour and depth. When I went to collect a glass of wine to relax with for a break in proceedings, this was my choice. The white wine that stood out as different, for me at least, was Metković’s Dubrovačka Malvasija. So many other lovely white local varieties also, and I’ll get on to some of those in a separate post. Our other class on day one was all about olive oil – from the types of olives grown in Dalmatia, to best production techniques, and how to taste and appreciate. Very comprehensive and somewhat technical, I’m now motivated to plant my own olive tree! On the other hand, perhaps will be quicker to go straight to the appeciation of some rather fine extra virgin olive oil already made by experts. To that end, we were given a wonderful example with intense aromatic flavour by Rizman winery. One to look for again! To complete our first day, we spent long into the evening at Kadena Restoran where we enjoyed the duelling chefs menu – in which resident chef Braco Sanjin and visiting chef Tomislav Nikšić both prepared their own version of each course. All accompanied by the very fine wines from Rizman winery. Between courses, we were treated to the entertaining comments of the chefs, who turned out to be long-standing friends. “His risotto can best be described as divine – god knows what’s in it“, etc! Fantastic food and hospitality as ever at Kadena, and many thanks to the ever-thoughtful Braco for my seafood replacement for the meat course. 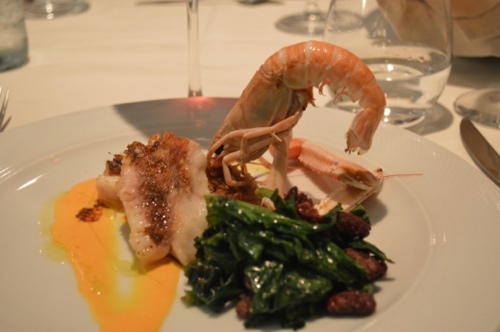 My special seafood course looks wonderful! At the start of day two we missed the presentation on Dalmatian white wines, but were lucky enough to get last minute places for the sneak peek into the cellars of Croatia’s finest winemakers. These are wines in progress, and so interesting to get an insight into the thought process, which in some cases is quite experimental and very exciting – for example the Krauthaker graševina that’s been macerated for a whopping 209 days. This is a whole topic in its own right! We popped into the talk by Blue Danube, who specialise in importing wines from Croatia, Hungary, and other parts of central/eastern Europe into the United States. We have a keen interest in helping that connection, and having our favourite wines available in California! Between the seminars, we tried to catch up on some drinking, er… tasting that is, in the main expo room. By now it was getting rather busy, and we tried to focus on red wines and on finding the best prošek and dessert wines. 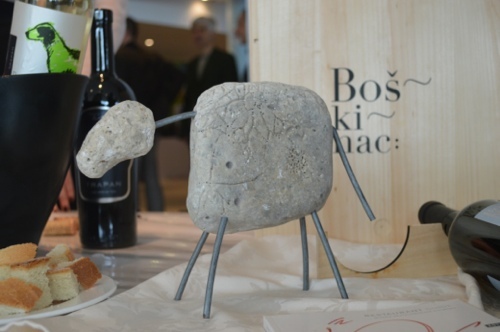 We found Boškinac from the island of Pag, where they make gegić and a wonderful deep red boškinac, and a very different Plavac from Lipanović on the island of Vis. Somewhere in there we came across some wonderful aromatic Bermet wines from up north in Samobor which they recommend as either after-dinner digestif or with ice as an aperitif. Would be great either way! The final seminar of the day had a distinct end-of-term feeling with a thoroughly entertaining presentation by Goran Zgrablić and his team from Taste of Croatia, punctuated in random ways by Bruno Trapan! Called Wine for fjaka, this session was a fun exploration of which wines best support the Dalmatian fjaka, which translates as siesta, or lazing around in the sun doing nothing! The wine choices were in a lighter, summer-on-the-terrace vein, all made from lesser known Dalmatian grape varieties. 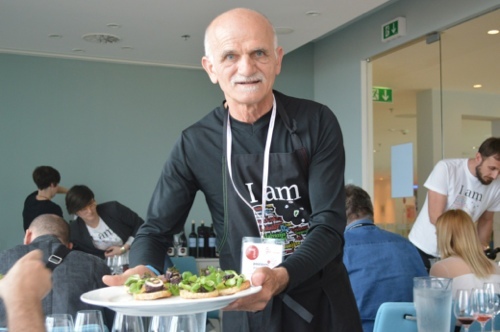 It was supported by tasty snacks beautifully presented by Čedo Kovačević, the unofficial guru of new Dalmatian cuisine. A fine way to end the day! It was great to see increasing interest from international wine experts and buyers at this year’s expo. 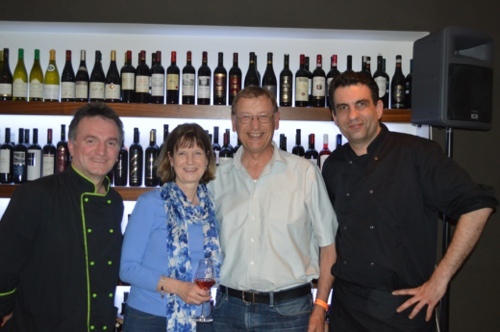 There was Cliff Rames of Wines of Croatia, over from New York, Eric Danch and Michael Newsome from Blue Danube Wines in California, and Jo Ahearne, Master of Wine a consultant from London. For all of of these folks, the expo was just one stop on a wider tour of the wine-growing region of Dalmatia. Looking forward to seeing more buzz in the international press about the exciting local wines. 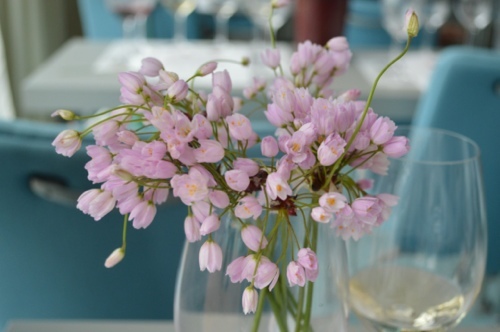 Wild garlic flowers are tasty! I’ve missed mentioning so many of the great and interesting wines on offer here, simply because I’m already familiar with them, or will be reviewing them separately. That includes, of course, my favourite Hvar wines which had a strong presence which was great to see! ← Dalmatian shutters – stylish and so practical!